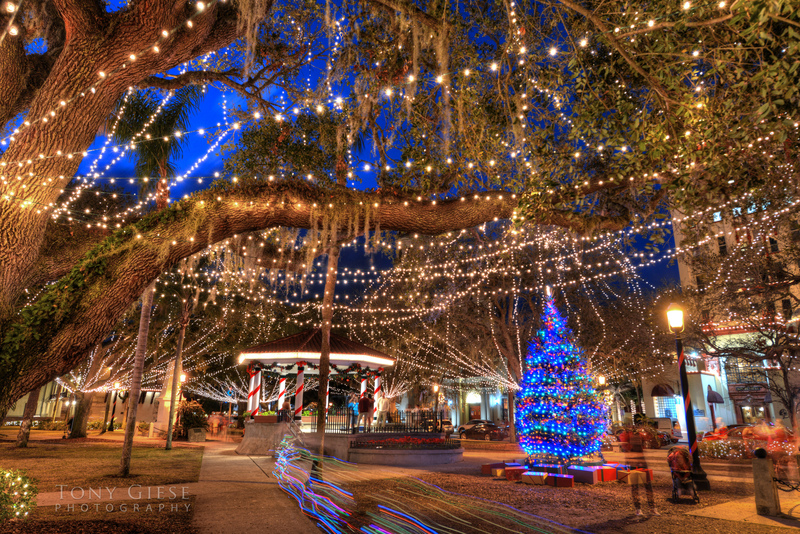 If you want to be in true spirit during the holiday season, you must visit the Nights of Lights in historic St. Augustine’s as it’s buildings, bridges, trolleys and horse drawn carriages are all dressed up with millions of tiny white lights that create a astonishing ambience throughout the nation’s oldest city. 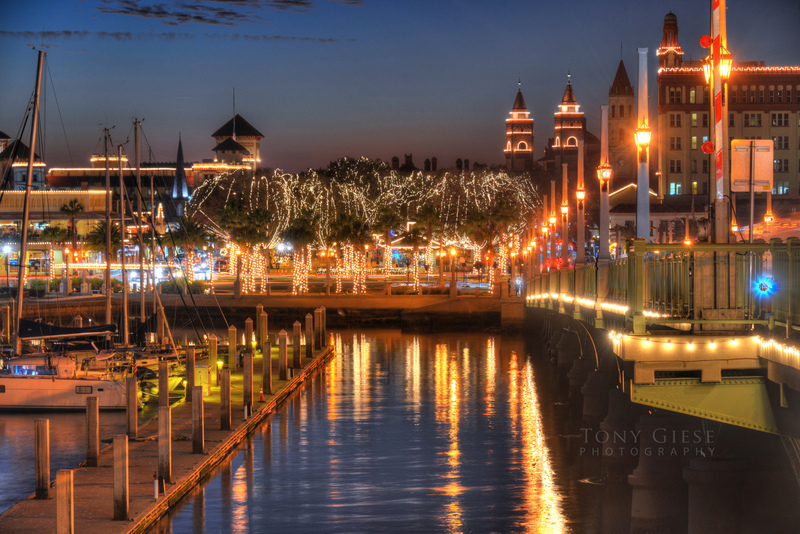 Nights of lights viewed from Bridge of Lions, St. Augustine, Florida. There is so much to photograph throughout the downtown area with it’s astonishing lights reflecting along the river bayfront to a blue lighted Christmas tree located in the center of the Plaza de la Constitución surrounded by wrapped gifts and lights draped around every tree. Holiday cheer is created as vacationers and locals sing carols all around the city of St. Augustine. DowntownSt. Augustine glows in holiday cheer. Visitors wander through the narrow brick cobblestone streets of downtown during Nights of Lights and gaze up at the glowing lights in the trees while taking in the alluring and remarkable sights. The Nights of Lights celebration was chosen in 2011 and 2012 by National Geographic as one of the ten best holiday lighting displays in the world. 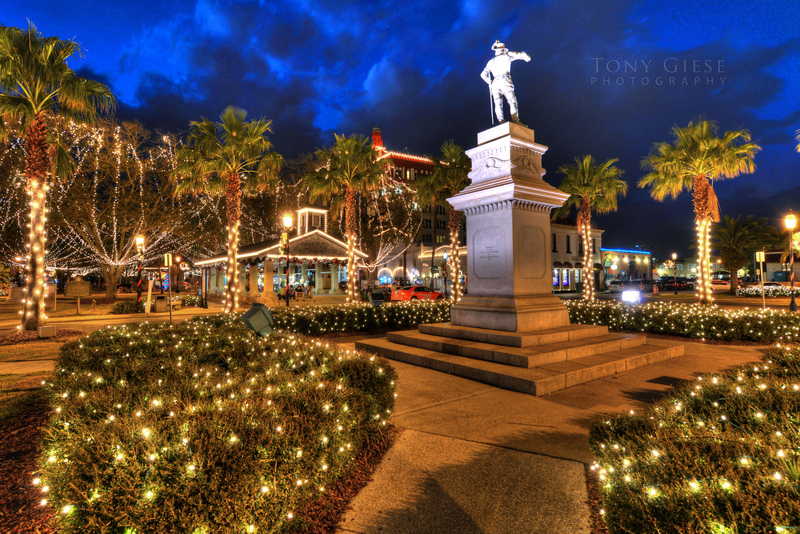 It’s the winter holiday festivity in St. Augustine where most historic downtown business and many residents take part of by lighting up their buildings. The beautiful display continues to dazzle, becoming more favored each year as a holiday destination for vacationers from all over the world. 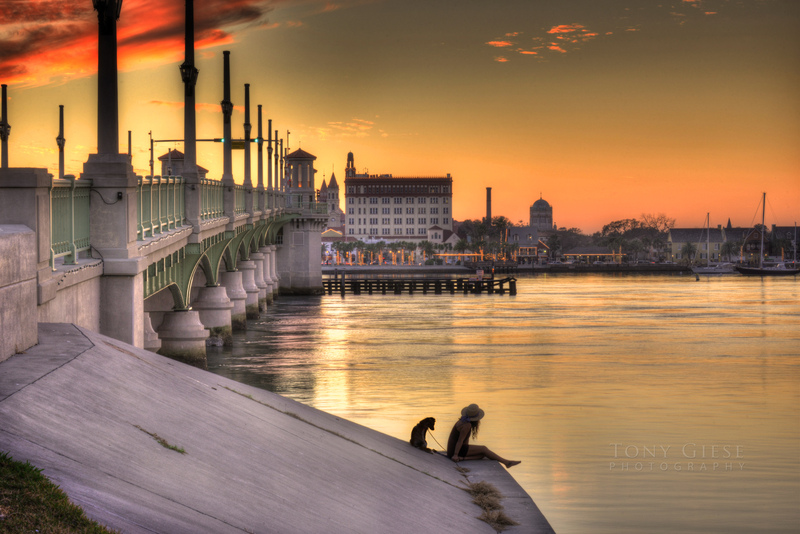 A girl sits with her little dog enjoying the river view at the Bridge of Lions, St. Augustine, Florida. Visitors and locals can dine amongst romantic outdoor patios illuminated by tiny glowing bulbs. Remarkable light displays are seen at Flagler College and the. The perfect guaranteed photo opportunity can be captured of the lighted Bridge of Lions from the bayfront is one of my favorites as a professional photographer. 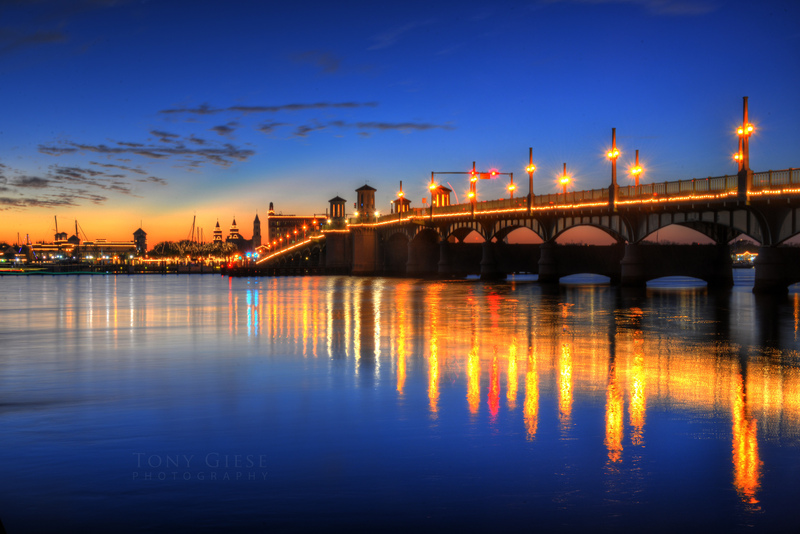 Dusk refection of Bridge of Lions, St. Augustine, Florida.